Whiting and Partners long established, dedicated payroll bureau is responsible for wages processing, staff cover, PAYE, NIC technical aspects, all IT issues, stationery procurement and maintaining the general confidentiality of this sensitive information. With our wealth of experience we cater for all requirements. This is reflected by our diverse client base that includes pension schemes and businesses with 2 to 250 employees, including those consisting partly or wholly of sub-contractors. 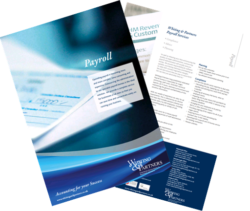 We also provide cover for in-house payroll departments during periods of staff absenteeism. Payroll is becoming an ever more challenging field to navigate, with numerous deadlines and legislative requirements for compliance. Many businesses find staffing this intermittent activity difficult and see outsourcing to a specialist RTI compliant payroll bureau as the obvious workaround. Get in touch with your local office and speak to one of our specialist advisers about our Payroll services.